Happy New Year! Goodbye 2015 and on to 2016. The last year was filled with big change and adventure, with periods of intense loneliness and stillness. Moving across the ocean and saying goodbye to everybody you know outside your immediate family is exciting for sure, but also difficult and sad at times. Thankfully the experience is only getting better and I look forward to taking on 2016 with renewed energy and newfound clarity. Thanks to my readers for all the support in 2015, it has meant a lot to me. More painting, more drawing, more exploring, more learning and bigger projects for the next year. I'm ready. What are you ready to take on in 2016? Inktober and letting myself fail. Last year I took part in the October drawing challenge Inktober. It was a lot of fun and ended on a high note so even though I struggled to get going I quickly forgot about the struggles. This year I looked forward to Inktober for months and even got numerous friends on board. Then it came and I chose to use a brand new Leuchtturm sketchbook and picked a theme. And I totally flopped. Sure there are sketches that I liked in that month and I did draw in ink every day. But overall the experience was disappointing. Why so different this year over last year? My drawings this year were easily better than my drawings from last year. Still I did not have fun and ended up looking forward to it ending. It is easy to blame it on the sketchbook I chose not behaving with ink the way I am used to but I could have easily just used something else and not forced myself to keep up with that sketchbook. I could also blame the restrictive theme of portraits that quickly bored me. But really the problem was me and my own expectations and my unwillingness to let go of them and enjoy the process. So now I am back to that book and sketching in ink and not sharing the drawings with the world and I am happy. No November challenges for me. Yeah right! Traveling with my family! Our fifth new country visited in 2015. Last week I visited Berlin with my family. After wasting my twenties not traveling and not being able to travel during much of my thirties due to babies we are using this move to the UK as an opportunity to travel all over Europe whenever we have a chance. So far that has meant trips to Paris, Rome, Barcelona and just recently Berlin. It's been great to see so much and share it with the people that matter the most. I am also so glad that I got into obsessive sketching and travel journaling before starting these trips because now I have the ability and desire to document these trips in the way that I enjoy. Years ago I tried a family blog but that just wasn't for me. And taking photos is somewhat fun but for me the fun ends when it comes to printing out the photos. 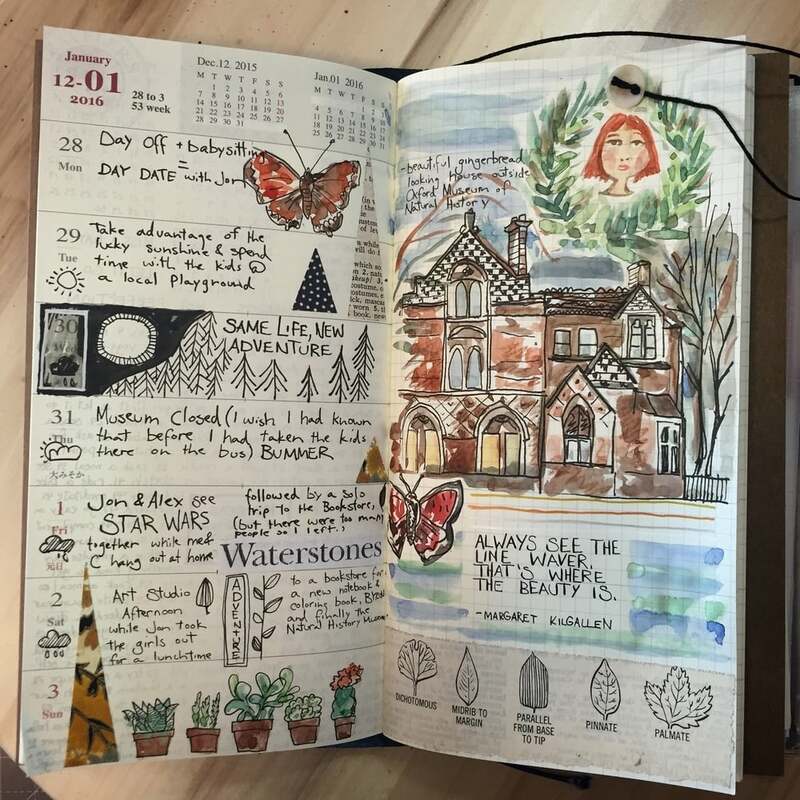 Sketchbook keeping is perfect for me since everything is automatically in a book! Keep on making and sharing. 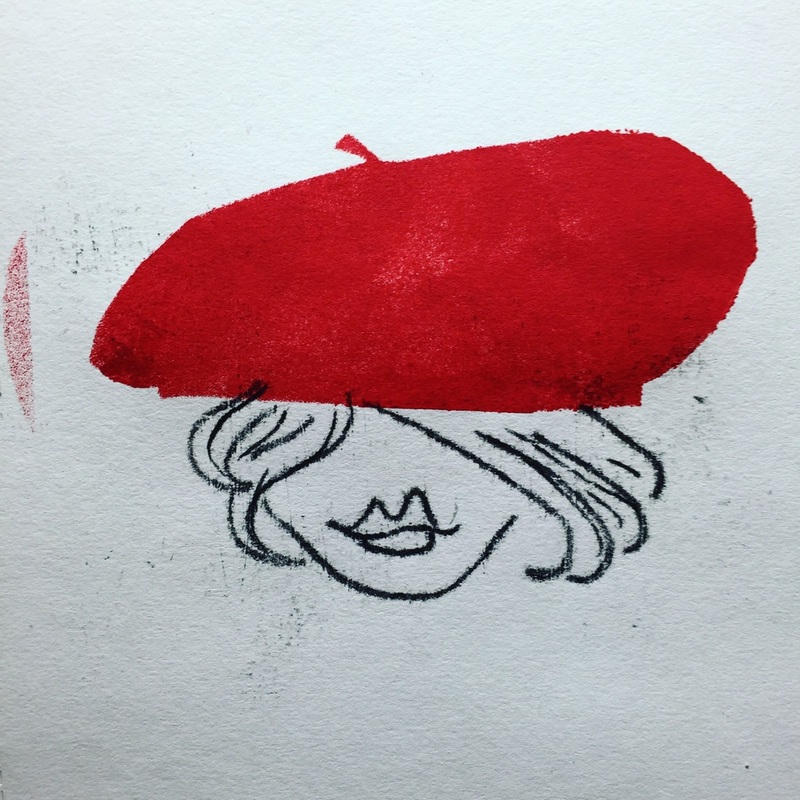 Often I don't find myself in the mood to share and that impulse can bleed into my creative output. A messy studio is a loved studio. But spending 5-15 minutes a week cleaning it up is probably a wise habit to form. Urban Sketching tests my limits. Urban sketching in Oxford UK around some parked bikes at a very crowded bus stop. Oxford gets filled with tourists from all over the world in the spring and summer, especially on the weekend and holidays. Yesterday was a bank holiday. Testing the limits of my ability to sketch around others. Then 1/3 through the drawing my pen ran out of ink and I needed to switch to a brush pen. Keep going. One hundred days of florals is starting to drag. But I am sticking with it and will adapt to make it fun because it is rewarding and I am learning a lot with this daily practice. But some days I am so tired. Some days I am so busy! I can't just collage all my prior florals and call them new again can I? No I can't do that. Daily blogging is really hard for an introverted perfectionist like myself. I always start out strong then fumble and frustrated toss the whole thing out. Not this time. This time I will fumble and keep going. Just not everyday. Sketching, blogging, tourism and being part of a family with young kidson vacation is (almost) too much. It's exhausting but exhilarating and oh so much fun. Each day is different and better and I end each day exhausted and happy. Love Paris! Is showing up more and more after a long spell of Oxford dull dreariness. Happy Friday! Learning how to be a regular blogger is hard for me. While I believe it is worth doing, as a visual person I often struggle with the format. Instagram on the other hand is easy for me to love. Sharing my words with an audience isn't so easy, but sharing pictures with few or no words needed is almost too easy. Thanks for following me on Instagram, if you haven't already you are missing out on a bunch of cool stuff over there! Loneliness when I'm healthy breeds artistic productivity and focus. Loneliness when I'm sick is just lonely. I've been spending the past few days resting as much as possible so I can be at full strength for Paris next week! And the next burst of creative energy. Sometimes my sketches don't go in books. And I am learning to be okay with that. It's still a sketch despite an obvious lack of binding. I could gather these loose paintings up and bind them in a book later. Or not. I am learning to not overthink and over plan the process of art making and what better time to start than now?